Our Service is second to none offering a reliable rapid turnaround. 305mm capacity with 63mm through spindle. Hydraulic tailstock and magazine barfeed. 762mm x 408mm travels with full 4th axis capability. 520mm x 408mm travels with full 4th axis capability. The latest generation software enabling the programming of both complicated 2D and full 3D components. To complement our fully calibrated conventional inspection equipment we have access to a MITUTOYO 5 AXIS EURO C544 coordinate measuring machine with the latest geometrical software. All inspection is carried out to ISO9002 specifications. In addition to the services above we can also offer a programming/applications service from single component programming to full turn key projects. We would be happy to discuss your requirements. 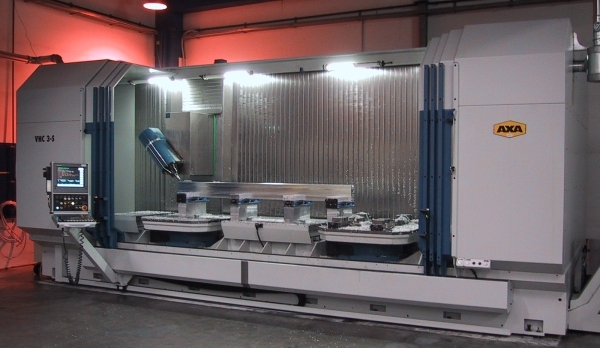 With the very high rapid feedrates of today’s generation of Horizontal Machining Centres, traditional cast iron cubes with their heavy weight (typically 250kgs for a 400mm square pallet machine) place very high stresses on expensive servo motors and ballscrews, this heavy weight coupled with the high cost of purchase makes the prospect of re-fixturing a daunting one. As a Horizontal Machining Centre user, producing a very wide variety of components for many industries, BMS Engineering & Design recognize the need for a cost effective and versatile alternative to the traditional Cast Iron Cubes and thus are now able to offer the BMS range of cubes for your Horizontal Machining Centre. Manufactured from aerospace grade aluminium and aged to T6 condition, BMS Cubes are computer modelled to simulate the toughest of cutting conditions and minimize deflection, even at the top of the cube during heavy cuts. They are then precision manufactured in house before being hard anodised. The four block machinable fixture plates are also manufactured in house. High strength and low weight. Typical weight fully loaded is 150Kgs. Cube itself is never machined. This ensures structural integrity of cube. All location holes are precision machined and helicoiled, all dowel locations are hardened. Steel fixture plates are easily swapped, the dowel locations ensuring accurate repeatability. By purchasing spare inexpensive fixture plates, repeat jobs can be left set up on the plates, thus greatly reducing re-setup times. Fixture plates can be machined to your requirements prior to delivery at extra cost.